"Install Windows 7 right from a USB with this official Microsoft tool." Windows 7 USB/DVD Download Tool is the tool created by Microsoft which allows to install Windows 7 right from any USB memory. 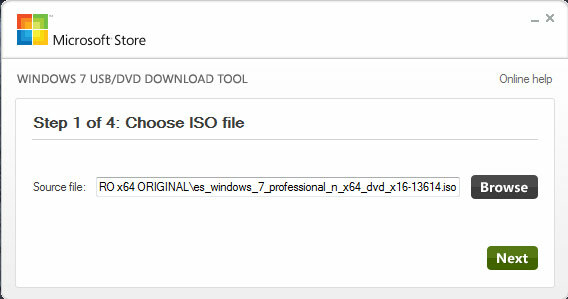 The only we need is an ISO image of the Windows 7 installation DVD in any of its versions. While running Windows 7 USB/DVD Download Tool we will need to choose the .iso image of Windows 7 which we want to have installed. After that it is needed to indicate which USB we want to use (of at least 4 GB of free space) and the program will convert the USB into a completely bootable installer of Windows 7. Now it is just needed to insert the memory into a USB port and start the computer from there. The advantages of installing the system from a USB memory is the easiness of the transportation and, above all, the high speed of the Windows installation in comparison with the DVDs, which work far more slowly.